Artur Mielcarek, M.Sc. Eng., a PhD student in the Department of Environmental Engineering of the UWM is one of this year’s laureates of the START competition of the Foundation for Polish Science. START is the largest scholarship programme in Poland directed to the best young researchers. The competition involved evaluation of the quality and the originality of the academic work and the most significant research achievements of the applicant. 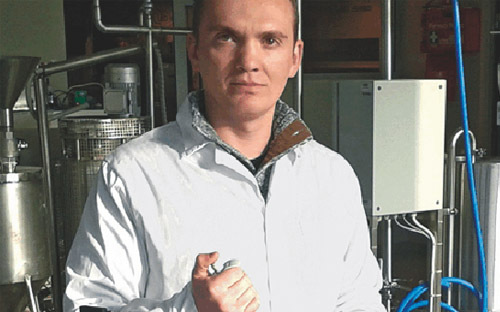 Artur Mielcarek is conducting research on the processes of biological assistance for nitrogen and phosphorus removal in sequencing batch reactors (with Prof. Wojciech Janczukowicz as his research supervisor). “This is an innovative solution, an idea that has not been fully examined either in Poland or in the world. Such reactors do not operate on an industrial scale in any place. Most treatment plants in which the processes of biological removal of biogenic components are employed using active sediment technology. The biofilm is used first of all in systems for removal of organic compounds and nitrification. A high content of nitrogen and phosphorus compounds in sewage after treatment pose a threat to the collection reservoir, which is a river or a lake. It accelerates natural eutrophication processes. The proposed solution results from the fact that in some cases classic sequencing batch reactors demonstrate an advantage over flow-through systems (flexibility with regard to the flow and the pollution load), and reactors with the biofilm – over systems using active sediments. The effectiveness of such a reactor in the removal of biogenic compounds is about 100%”, says the young scientist. Artur Mielcarek is also a beneficiary of the Preludium programme of the National Research Centre. In 2013, he obtained a scholarship of the Polish-American Freedom Foundation. The Faculty of Environmental Sciences of the UWM, where the young researcher is employed, is a university leader in terms of grants received by young academic workers. Out of 11 employees awarded START scholarship, as many as 7 worked in this faculty. Over 100 scholarships are awarded every year in the START programme. The laureates of this year edition were selected out of 1,291 applicants.